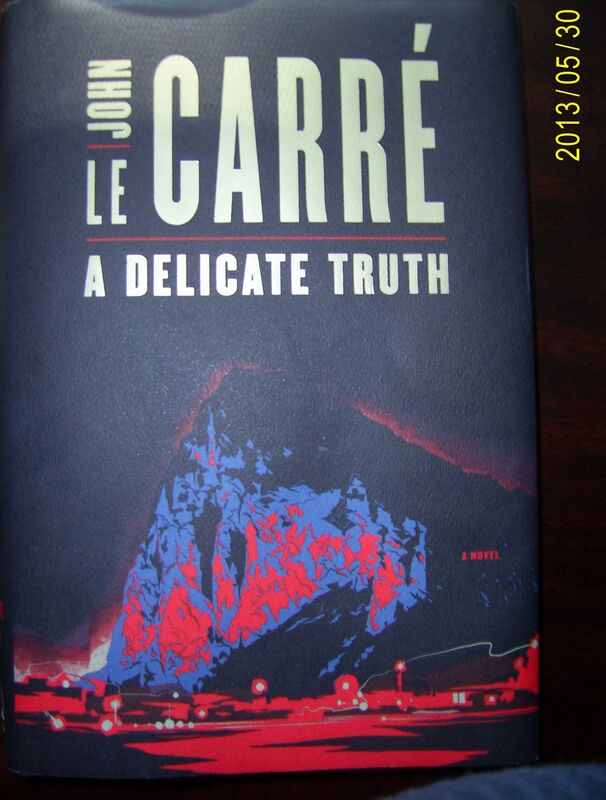 On Sunday May 26/13, I heard John Le Carré interviewed about his new novel A Delicate Truth. (free CBC app, Arts/Writers and Company podcast May, 26, 2013.) He agreed to do this interview because he had been interviewed by Eleanor Wachtel in 2010. He told her, once they were off the air that he would not be doing any more radio interviews. (This was a decision based on prior consideration and not a reaction to this interview, which he greatly enjoyed.) So I consider myself fortunate to have chanced upon it as I drove home. Indeed, I consider myself fortunate that he published this his twenty third novel, so fortunate that I tried to buy it several days before its release. Le Carré can be trusted to tell a good story and to do so with elegance and wit. But, looking over reviews of the novel, I found that not everyone agreed. Most reviews began by referring to George Smiley, the protagonist of Le Carré’s breakthrough novel, The Spy Who Came in From the Cold as well as Tinker, Tailor, Soldier, Spy, the recent Gary Oldman movie. Once the Berlin Wall fell, readers wondered what Le Carré would write about. But, of course, there are always enemies, big pharma – The Constant Gardener, arms dealers – The Night Manager, unscrupulous bankers –Our Kind of Traitor. Spies were replaced by whistle blowers, but there was still intrigue enough for readers as well as plots that twisted and turned toward ambiguous endings. Yet some discontented reviewers lamented that these later novels lacked the subtlety and complexity of the earlier ones. The Globe and Mail reviewer of A Delicate Truth, Richard Poplac, declares that Le Carré “has reduced himself to writing a series of screeds”; he says about the writer’s recent protagonists, “not a word out of their mouths rings true” and calls the novel “a clunker”. Set against Poplac’s rant, were more positive comments; from the LA Times, “While some fans will miss the ambiguity of earlier books, A Delicate Truth delivers plentiful intelligence and thrills”. George Smiley’s conundrum was whether or not he could preserve a modicum of humanity while serving his country or whether the compromises he would be forced to make in its service would make such inroads into his soul that he would be as bad as the enemy. Indeed those Cold War novels depicted the Western Intelligence Agencies as more or less morally equivalent to the KGB. A Delicate Truth focuses on two men in the British Foreign Office who face the same challenge. We meet the first one in a hotel room in the British Crown Colony of Gibraltar under the name of Paul Anderson, going slowly mad as he awaits a phone call to tell him that the mission is underway. “Paul” is a low flyer in the foreign office, a few years from retirement, “a violet by a rocky brook” sort of person: he has never attracted attention. The mission, once it gets underway, turns out to be the extraction of one code-named Punter who is about to buy missiles, “a jihadest equivalent of the Scarlet Pimpernel, an even wilier version of Osama Bin Laden” (National Post – 13/05/03). The land operatives are British soldiers, temporarily demobbed so as to be deniable, and the sea operatives are employees of an American private military outfit called Ethical Outcomes. Paul is there to act as “red telephone”, the eyes and ears of Fergus Quinn M.P. At the moment when the attack has to go or be called off, Paul heeds the advice of Jeb, the British soldier in charge, and refuses to give the go-ahead. Other, rasher heads prevail and, according to reports, the mission is a brilliant success. Punter, apparently, is spirited off to the American ship lying off-shore and suffers Rendition. After that long first chapter, we find ourselves back in London witnessing the moral struggles of a younger foreign office minion named Toby Bell, who has bugged the office of his boss Fergus Quinn, and is about to retrieve the tape. Before we get there, though, we get Toby’s background. He is a thoroughly decent fellow who wanted to resign when Blair took the nation to war in Iraq under the false pretense of weapons of mass destruction. His mentor, Oakley, tells him, “Hyprocisy is the tribute that vice pays to virtue, dear boy. In an imperfect world, the best we can hope for.” Toby finds himself summarily shipped off to Madrid and the Cairo, rising with each step, until now fluent in Arabic, he returns to London to be Quinn’s private secretary, with a mandate from superiors to keep the Minister out of trouble. Only thing is, Quinn never gives Toby a glimpse of what he is up to, hence the bugged office. Of course Toby finds out something very troubling that has to do with a vaguely British operative named Jay Crispin and the American outfit, Ethical Outcomes. Then we find ourselves years later in Cornwall, Le Carré’s home territory, watching Sir Christopher Probyn settle into his retirement as a benevolent lord of the manor personage. Wait a minute, isn’t this Paul! And doesn’t he magically run into Jeb, disgraced and reduced to “tinkering” and doesn’t Jeb have some awful here-to-for repressed information about what really happened in Gibraltar! What to do? Kit Probyn aka Sir Christopher aka Paul knows just the thing. Call that number he called before he met Fergus Quinn. The number belongs to Toby. Thus the forces for good or at least for the truth begin to assemble. The third member of the group is Kit’s daughter, Emily, a doctor who treats the poor and needy in London’s east end. There we have the essence of the book: who will stand up for the individual who has been deemed unimportant, an acceptable loss in the face of the war on terror. And can the delicate truth be brought to light in the face of bureaucratic duplicity? Will the well-meaning opponents of officialdom find themselves declared traitors? In a world where “War’s gone corporate” and intelligence is purchased from private spy agencies, truth becomes relative. It is true that A Delicate Truth, like the other post-Cold War novels, lacks the irony of the Smiley books. Something changed so that Le Carré could no longer afford that detached point of view. Certainly 9/11 and the resulting War on Terror and the 2003 invasion of Iraq played a part in that. I find it hard to regret that. A novelist is not a made-to-measure workman. He writes out of his soul and conscience. And I am very grateful to have yet another brilliant novel from Le Carré’s pen. This entry was posted in books, reading and tagged A Delicate Truth, Gary Oldman, George Smiley, Globe and Mail review, John Le Carré, LA Times review, National POst review, Our Kind of Traitor, Richard Poplac, The Constant Gardiner, The NIght Manager, The Spy Who Came in From the Cold, Tinker Tailor Soldier Spy by joyceahowe/hood. Bookmark the permalink.